It all came together, more or less, in August of 2017. Two Minnesota girls had come all the way to the Cornhusker State, a field that served as a thread of the coast-to-coast moon shadow sash that would connect America’s left shoulder to its right hip—the Path of Totality, astronomers were calling it. Here, they meant to bear witness to the Great American Eclipse… although one of them bore a second, secret motive, as well. The two stood among fellow crane-necked lookouts, silver-shaded eyes turned toward the dying daylight. And then the cosmic dance began: the moon cut in on the sun like a jealous ex while heat and light receded from the ground in equal measure. Shadows sharpened like pirate hooks, then melted into themselves. The blue sky was no longer sky blue; the far horizons formed an everything-sized halo of rust. The yin/yang progression of sun and moon generated a lopsided sky sparkle that resembled a goddess’ diamond ring. And within the outlaw night all around it, a single glint asserted itself—it was the planet Venus, winking knowingly through violet wisps of indigo vapor. Which is when Nora Powers proposed to Sadie Plendl. That second, secret motive was secret no more. The proposal was not just accepted; it was replicated. Says Nora, “A few weeks later, Sadie planned a bike adventure around Minneapolis to many of the significant-moment places for us. Then we ended at Marvel Bar for the [second] proposal. It was really sweet.” That proposal was accepted, as well, making the notion of marriage unanimous. Those twin proposals had been nearly twenty years in the making. The two women had met before they were women—that is, in the fourth grade—but no sparks flew then because, c’mon, it was the fourth grade. A Super Bowl party brought them together again as college students, and Sadie accepted Nora’s proposal for roommate-mony, which, after a year or so, escalated to dating-mony that itself eventually evolved into matrimony… a final arrangement the soon-to-be-wives approached with temperate earnestness. 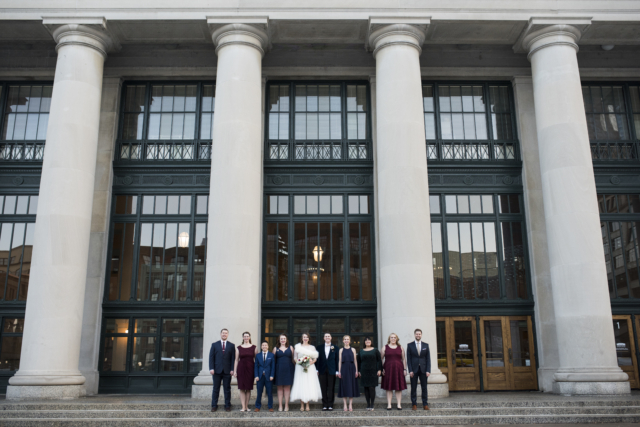 For the couple, commitment to each other was paramount… but commitment to stodgy tradition was not. 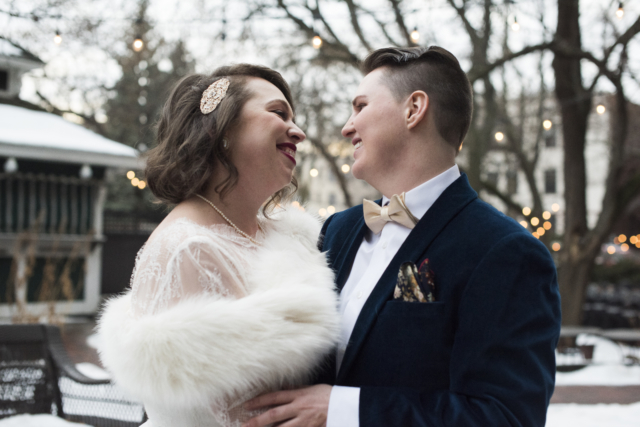 In keeping with the notion of selective tradition, the two women wrote their own vows. Such invocations can summon genie-like feelings that can be hard to control. It all came together, more or less, in August of 2017, and it’s stayed together ever since. 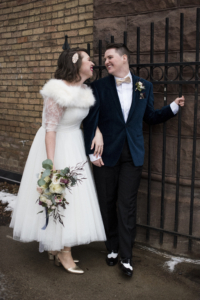 Like the eclipse that turned their schoolyard start into engagement, Nora Powers and Sadie Plendl continue together on their own personal Path of Totality.